Me: Do you sell goat shoulder? Butcher: We have a bunch of goat; you come in; take a look around; pick out the goat you like, I cut you the shoulder. Uncle: We’re having goat for dinner. Young Niece: No, you can’t! Young Niece: You just can’t! I read somewhere it’s not good for you. Me: We’re cooking goat tonight. Mother: What sound does a goat make? Me: I don’t know. Can’t wait to try it. Conversation #4Me: If I can find a goat can you take me to the butcher to pick it up? Carpooler: Please tell me I’m misunderstanding this. I assume you mean the butcher is going to do what he has to do with it and that you aren’t asking me to have a live goat in my car?? Husband: I’m going out early tomorrow. Me (1/2 asleep): Whatever floats your goat. Crazy girl in Pilates class: Are you have a bahhhd day? If you haven't figured it out by now....yes, we cooked our first goat this past weekend. It was delicious; very tender and tasty. I loved the cinnamon in this recipe. I can't wait to eat it again...which will probably be real soon. A 51/2 lb goat shoulder for 2 people yields lots of leftovers. I'm looking forward to goat sandwiches. Season the goat with salt. Cover and refrigerate overnight. Preheat oven to 275. In a heavy bottomed pot, heat olive oil over medium heat. Add the garlic and cook, stirring occasionally, for about 3 minutes, or until softens and starts to turn golden. Add the wine and rosemary and boil for about 8 minutes, or until the wine has almost fully evaporated. Meanwhile, place the tomatoes and their juice in a bowl and crush with your hands or the back of a wooden spoon. Once the wine has reduced, stir in the tomatoes with their juice and the cinnamon. Bring the sauce to a boil, then remove from the heat. In a large roasting pan, evenly distribute the goat pieces. Carefully pour the sauce over the goat. Cover the roasting pan with aluminum foil and transfer to the oven. Braise the goat for about 31/2 hours or until the meat pulls away from the bone. Remove the pot from the oven when done and let the meat cool in the braising liquid. Lift out the goat from the sauce and pull the meat from the bones, removing it in large chunks if possible. It should come away easily from the bone and the connective tissue. Skim off most of the fat from the sauce, remove and discard the rosemary, taste for seasoning and add more salt if needed. 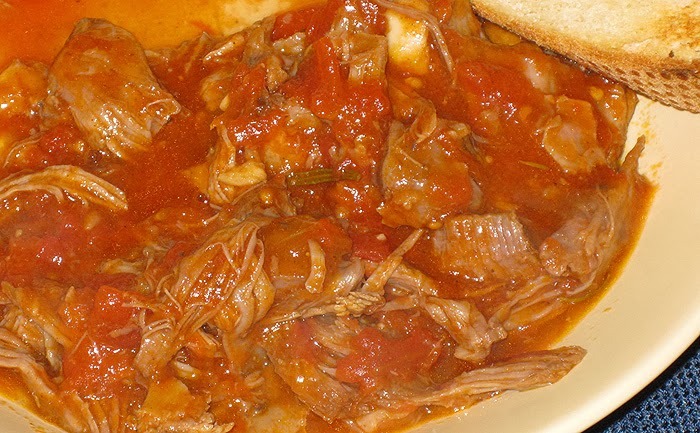 To serve, return the meat to the sauce and bring to a simmer. Ladle the meat with some of the sauce into warm bowls and finish with a drizzle of olive oil. Serve immediately.